\nWell this is my first wagon, it\'s taken sometime to getting used to driving something bigger than a coupe or a sedan but overall this is my 4th Accord. 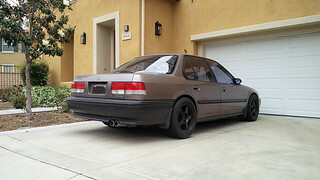 \nI bought it from another member on here (Mtnbikkah) since he moved on to an Acura TSX. \nLast fall me and another member Accrdwgnguy helped replace the steering rack on this car and the subject of him selling the wagon came up. Months later I finally bought the car from him and I can say I\'m going to enjoy this car for quite sometime. \nIt feels great to finally own a car that is pretty much stock. I figured I can take my sedan off the road for awhile while I figure out what I\'m going to do next with it. \nOver all I\'m happy I got another members car and I\'m definitely going to take real good care of it, he actually gave me a book that has all the dates of the oil changes and major stuff that he has done to the car over the years of ownership. Henry, congrats on the wagon, and a clean one at that! Looking forward to see what you do to her. Also the more I\'ve been thinking about it, I might need a wagon for myself in the future, especially after camping with the coupe twice now. It\'s pretty much fully loaded with everything we need to camp, with room left for us to sit in the front seats. \nThanks Will! Yeah its not a bad car at alll. I like it, definitely different from the coupe or sedans I\'ve owned in the past. Motor runs so well that I actually don\'t want to swap it. Only has 186k on the motor and body. \nWagon looks good! Surprisingly clean for a New England owned cb. \r\nFluid Film is great, I use it all the time on my Tacoma. \r\nLooks great Henry. I\'m excited to see what you can do with it. \nThanks Dan! And yes I\'ll definitely let you know once it\'s on the road. I\'ve taken it on the road but not too far. \r\nWagon looks good! Surprisingly clean for a New England owned cb. \nThanks Marty actually it was mostly down in NC when my friend owned it but then he moved back up to Nashua and it actually sat for a few months before I picked it up. \nThanks Mike! I actually want to keep it fairly simple now. It definitely needs a good detail both in and out but I love it so far. I might ditch the tan interior and try and track down a gray interior and swap it in. \r\nI see you\'ve made some good progress with your Vette. Welp. After one month of ownership I\'ve tacked on an additional 3k miles and during my ride to NJ yesterday I hit 190k. 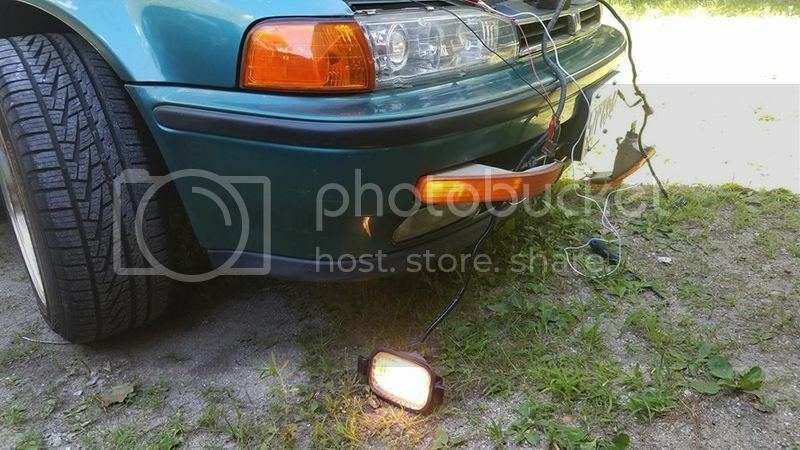 \r\nAbout a week or two after the photos were taken of both cars, I made the decision to part out my sedan and in the process I\'d say I made a good amount of money from the parts I sold. 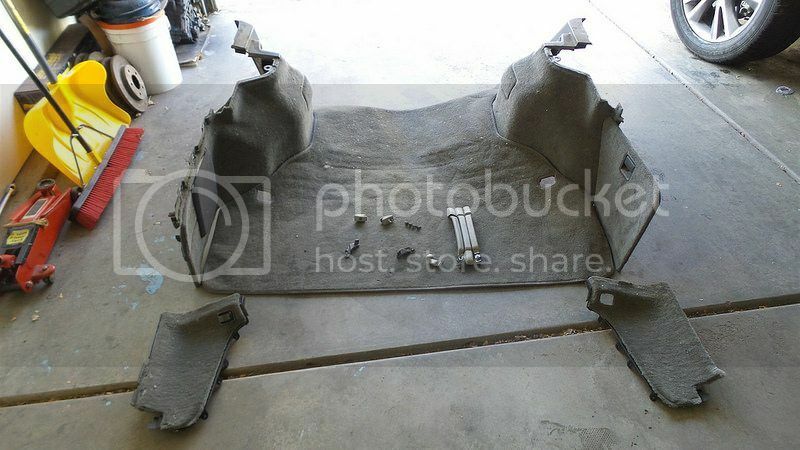 Sad to see it go but I\'m happy the parts I sold would go on to people who needed them. \r\nWith that said, I started the process of rebuilding the suspension and brakes, first order being the NSXs. I\'ve had them since 2008 when I did a 5 lug conversion on my old 5th gen and they have never seen a major overhaul since then. \r\nAnd thanks to apalileo\'s thread I\'m also going to replace the speed bleeders with the same ones he bought off of eBay. 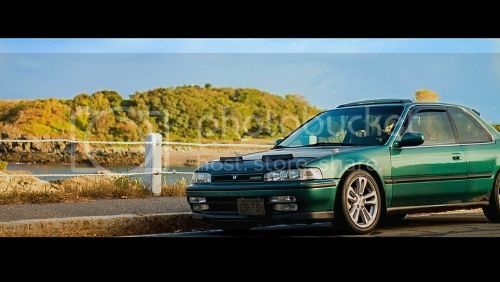 \r\nSo if anyone here who ever rebuilds their NSXs just remember this list. \r\nI plan on having the calipers sandblasted and thoroughly cleaned but I\'m unsure of red or going back with black again. \r\nI\'ll try and update this thread with pictures. And thanks to apalileo\'s thread I\'m also going to replace the speed bleeders with the same ones he bought off of eBay. \nI\'m famous! Haha! Speed bleeders are definitely a plus. These with a basic vacuum bleeder kit and you never have to press the brake pedal! Simply follow the bleeding pattern and then repeat (remembering to top off during the process). I had a large empty peanut butter container to dump fluid as the bleeder\'s cup would fill up quickly. \r\nThanks for the info on the 40mm pistons, too! Well 2 months later I\'ve racked 192k miles, did a run to NJ when my aunt was down there and met up with Excalibur02 to give him some parts from my old car he bought. 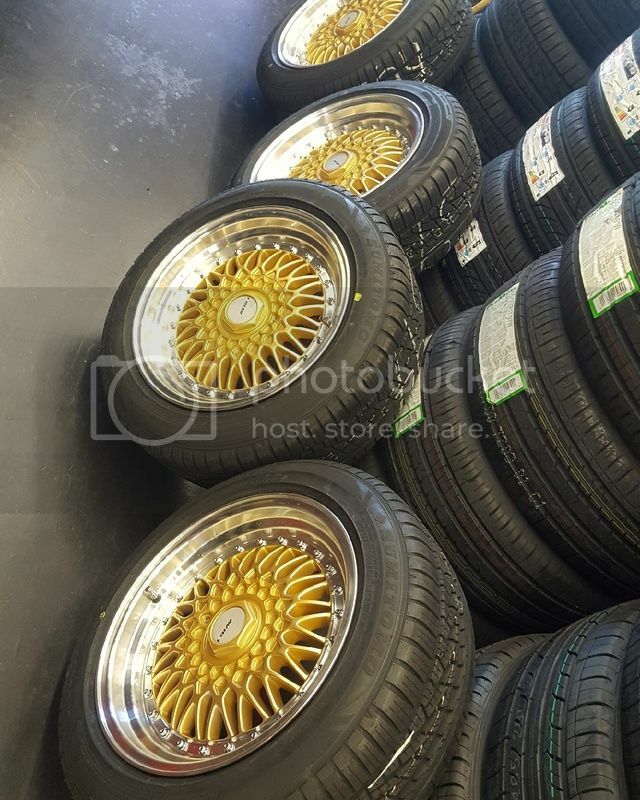 \nAnd in the meantime I ended up trading my H22 for a set of Avid 1 wheels I know they\'re knock offs but eh I need a set of wheels and tires so I called it an even trade. \nAnd also I\'ve been collecting parts to do a interior change over from tan to grey, I\'m going to be cleaning them up as well before I install them in the car. 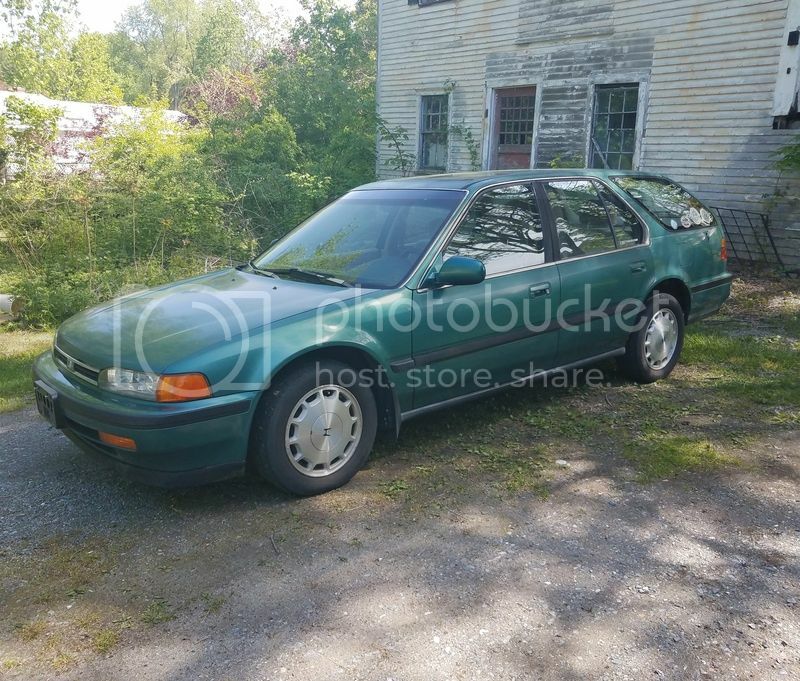 \nLuckily I found a 1991 Accord Wagon with the Type B interior and a 1992 Accord wagon also with a Type B interior. I was able to get as much as I could off the 1991 since nearly everything was still intact and a few smaller pieces from the 1992 as well. \nI skipped out on the front seats since I\'m on the hunt for cloth RSXs in the near future and I\'m holding out on the back seats for now. 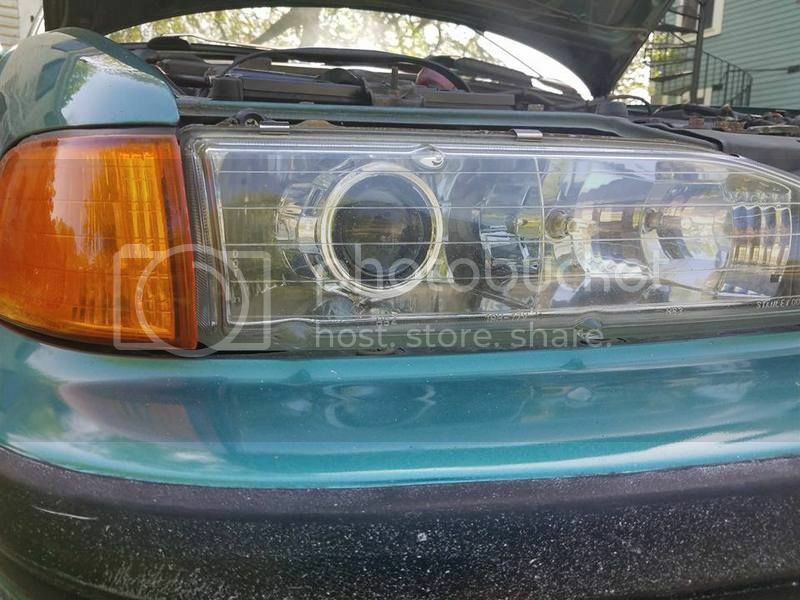 \nA 91 (I think) Arcadia green wagon was for sale around my area last year and I am not sure if a member picked it up or not. I love that color; especially on wagons. \nNot pictured is the composite wiper arm and blade from a 2005 Element shorten the reach for sure but I wasn\'t a big fan of the old wiper arm. Looking good Henry! The gold looks great on the green! Based on your offset, you\'ll definitely have to consider rolling/trimming the fenders and camber adjustment to avoid rubbing when you lower it. \nThanks Anthony! I\'m actually thinking about getting rid of the wheels. Offset is alright but I\'d hate to have to roll fenders when or if I ever decided to lower it. \nI do however have an H22 intake manifold so I\'m leaning towards slapping the upper half on my motor, never done it before but from what I\'ve read and have been told it does make a bit of different on the F22A. \nI made some major dents in the interior swap although I\'m missing a few key parts to have it as a completed project. Installed my CorSport solid shifter bushings and currently I hate how they feel a bit binding and rough. \n- Cheddas Auto solid linkage bushings. Unfortunately they\'re sold as a set (interior and exterior linkage bushings) and can\'t be separated so I\'m going to sell the outer ones and order spherical set from Hybrid Racing at least with that set it allows for slight movement instead of a stiffer shift. \nI still hit up the local yards for random stuff. I actually scored a complete set of 1st gen Odyssey foglamps (pretty rare) and it\'s the 2nd time in 4 months I\'ve ever come across a complete set got it for a steal and I\'m about to double my money back on them. \nYes. 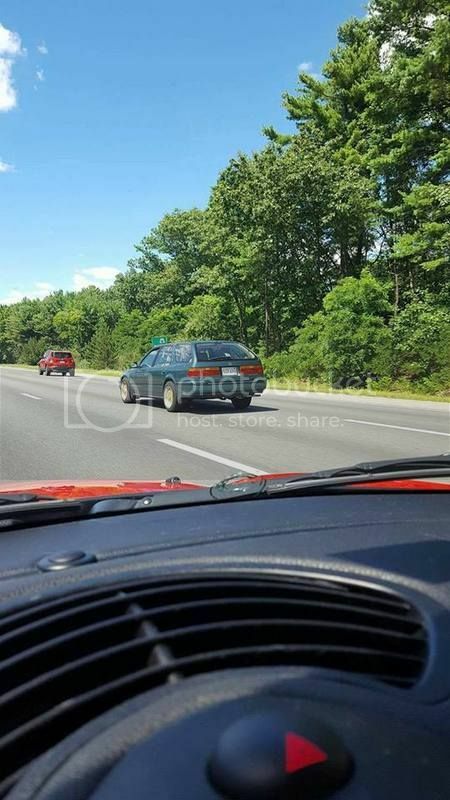 That\'s a 1993 LX sedan with 58,567 miles I couldn\'t believe it. Everything in the interior and the front end was clean even the original trunk board was intact and NOTrotted haha and based on the markings it runs AND drives but the rear qtrs were rusted out. \nTalk about a throw away. \nMakes me think it sat in someones driveway barely driven only to meet it\'s fate the junkyard. I don\'t know if that\'s a car that could be saved from the wrecking yard as I don\'t know what the laws are in Massachusetts. \nWell that\'s all for now, things are slowly making head way but it;s progress none the less. Just realized I have to rehost my pictures. Shame P-Bucket went that 3rd party route. \nHUGE shout out to CyborgGT a.k.a Dave for coming through big time and helping me out with parts sourcing. 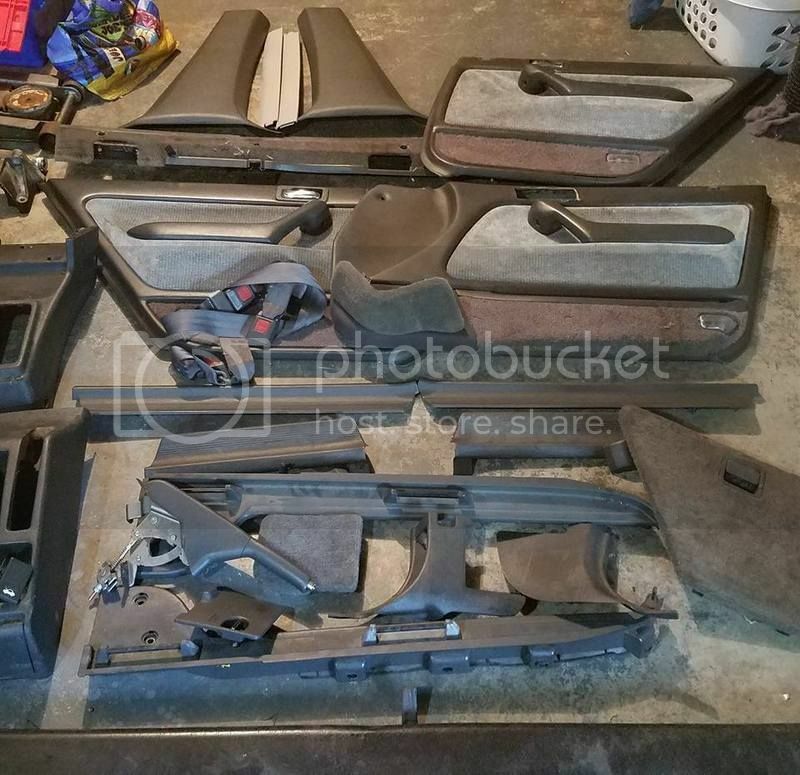 It was well worth the money to get parts from a junked wagon from his area so right now along with that big box of parts I also have a another box that contains the rest of the rear pieces I needed for my interior swap. \nGood to know some good people out there. \nRecently scored a pretty cool half antenna switch and harness from 604_SE a.k.a Farad so that too is on it\'s way., I just have to figure out if it\'s compatible with the USDM antenna..which I can still order brand new from Honda so that\'s also in the works. \nI won\'t touch the interior until winter passes so I know I have a huge task ahead of me to tackle once spring hits. Other things I have planned are to replace the timing / balance belts along with the water pump, and the major engine seals. \nI really had my mind set on an H22 swap but I think this time I\'ll just swap out transmissions. Original motor still runs like a top at 206k miles so I really see no sense in swapping it out unless the motor died. \nABS still works but I trying to figure out if the tone rings on a 5th gen Prelude and a 4th gen Accord are different. 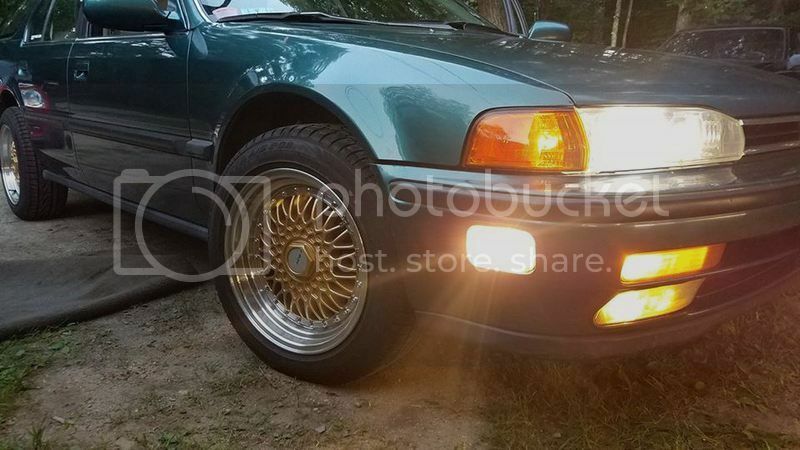 I remember when I did my first five lug swap in my old 5th gen the ABS light would never shut off and I traced it to the tone rings since I think the teeth spacings are different. \nThat\'s pretty much it for now. Happy to help, we\'re all family here . The tone ring is on the axles, like Cyborg is alluding to. There should be no reason at all that an ABS issue arises from a tone ring problem as long as the OEM axles are used. \nyeah but from my past experience the rear hubs are the ones I wanted to compare to see the differences. I think the number off \'teeth\' on the rings make a bit of difference. I know with my 5th gen I used stock axles and the ABS light stayed on afterwards. Well this is my first wagon, it's taken sometime to getting used to driving something bigger than a coupe or a sedan but overall this is my 4th Accord. I bought it from another member on here (Mtnbikkah) since he moved on to an Acura TSX. Last fall me and another member Accrdwgnguy helped replace the steering rack on this car and the subject of him selling the wagon came up. Months later I finally bought the car from him and I can say I'm going to enjoy this car for quite sometime. It feels great to finally own a car that is pretty much stock. I figured I can take my sedan off the road for awhile while I figure out what I'm going to do next with it. Over all I'm happy I got another members car and I'm definitely going to take real good care of it, he actually gave me a book that has all the dates of the oil changes and major stuff that he has done to the car over the years of ownership. Last edited by HenRoc; 06-12-2018 at 12:14 PM.